Though not set in stone, these following are some general guides to spectating the different race types. Track is essentially made for spectating: Everything happens in a small, visible area, and the action's continuous and very dynamic. 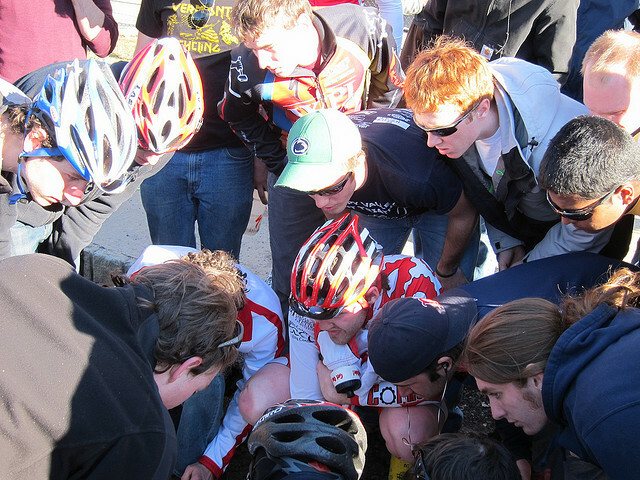 Cyclocross is also a great spectator sport. Lap times are just short enough, about 15--30 minutes, that you'll see individual riders a handful of times. More importantly, the races invariably break down into a steady stream of riders and a few clumped groups, ensuring constant activity. Courses are also generally very accessible, but be prepared for excessive amounts of mud. Criteriums almost always make for easy, exciting watching. Short courses with 2--4 minute lap times, high speeds, and technical riding make these the primary venue for road season spectators. It's typically easy to move about the course to watch from different locations, you'll see the riders many times, and the action unfolds right in front of you. Road Races are often tough to watch because of the long laps. Groups may not come around for anywhere from 30 to 90 minutes and typically do very few laps, so spectating is limited. It's also often not feasible to park and spectate at the most dramatic locations, and the action typically unfolds over a long period of time, well out of sight. Circuit Races vary widely, largely depending on how long the course is and whether they're more like a criterium or a road course. 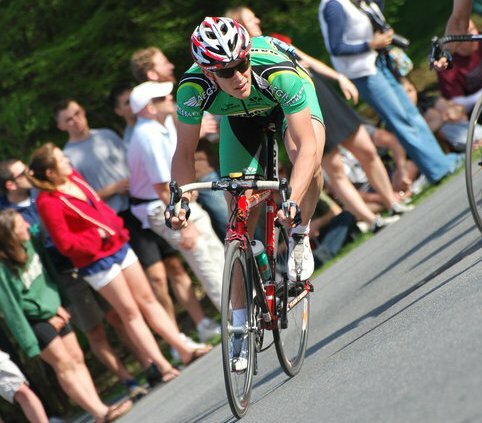 Team Time Trials (TTTs), Individual Time Trials (ITTs), and Hill Climbs are actually frequently surprisingly exciting. These are among the most challenging events for most riders, and particularly for the Team Time Trial a great deal of precision, skill, and fitness is required to do well. In addition, although each rider or squad generally only goes by once or twice, there's always something going on for the duration of the event because all of the riders or squads are riding at short intervals rather than as a pack. Short Track Cross Country (STXC) is generally very spectator friendly. Short laps of 2--5 minutes mean you'll see riders many times, and it's generally feasible to walk around and watch from many points on course. Cross Country (XC) is often difficult to spectate. Lap times of 30--75 minutes mean particular riders come by infrequently, and generally do only a few laps, although there is usually a steady stream of riders as the fields spread out. However, these can be great races to watch as part of a long hike around all or part of the course. Downhill (DH) is very spectator friendly, though often not very accessible. Riders in these races demonstrate a great deal of riding ability, carrying high speeds on very challenging trails, and there is a steady stream of excitement as they come down in roughly minute intervals. Walking along the course may require traversing difficult, steep terrain in poor conditions, but is generally very rewarding for those willing to put in a slightly technical hike. Note that almost all mountains require spectators as well as racers to purchase a ticket in order to ride the lifts to the top of the mountain, so most spectators walk up the course from the bottom. Dual Slalom (DS) is generally the most spectator friendly MTB event. Courses are extremely short and typically have large sight lines, enabling you to watch all the action from one location. Once racing starts it flows continuously, with heats taking off in rapid fire fashion, and these courses are usually fairly accessible from the lodge or parking. Slalom also has awesome atmosphere as all of the racers are congregated in one place and most of the remainder of the conference will also stick around to watch.